Marilyn Manson's new album experiments with dark blues and alt-country, but it fails to become truly memorable considering the risks each song avoids. Little Brian Warner, better known by his stage name Marilyn Manson, made his career over 20 years ago with imitative schlocky imagery and tongue-in-cheek shock value lyrics that begged for (and received) controversy -- and thus media notice. Backed by his band of the same name, Warner’s style of simplistic and shocking alternative metal somehow managed to achieve great financial success, major label backing, and the controversy and attention that he so desperately desired. This notoriety continued as the singer became the target of parents’ groups and was mentioned as a possible inspiration for the Columbine High School killers’ rampage. None of this did anything to harm record sales, of course. If Marilyn Manson was ever truly “relevant”, that time is in the past. While his initial album, 1994’s Portrait of an American Family received mixed reviews, it also sold 645,000 copies and led to the band’s signing with Interscope records, thanks to Nine Inch Nails’ Trent Reznor and his Nothing imprint. The resulting album, 1996’s Antichrist Superstar (a title simply designed to inspire controversy), proved to be the high point of the band’s career both critically and commercially, with positive reviews and unit sales of over seven million copies. This, however, was hardly “only the beginning”, but rather the beginning of the end. While receiving generally positive reviews, 1998’s Mechanical Animals sold less than a million and a half copies. Although respectable and hardly a flop, these numbers are a far cry from the prior record’s success. 2000’s Holy Wood (In the Shadow of the Valley of Death) sold only 573,000 copies, slightly more than one third of the prior album’s sales and even less than the band’s debut, in spite of the fact that this fourth album was intended to be part of a trilogy with the previous two. (Somewhat humorously, the trilogy is told in reverse order). The trend continued with 2003’s attempt at a comeback, The Golden Age of Grotesque, which sold about 50,000 less units than its predecessor, carrying with it a much more negative critical reception. 2007’s Eat Me, Drink Me sold slightly over half of Grotesque’s units, 2009’s The High End of Low sold slightly over half of Eat Me, Drink Me’s units, continuing the trend in negative critical reception. The poor performance of Eat Me, Drink Me also resulted in the band losing their major label support. 2012’s Born Villain was released on the band’s own label, “Hell, etc.”. The LP received negative reviews and the lowest unit sales of any Marilyn Manson album to date. 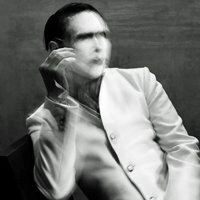 Now that it's 2015, Marilyn Manson is back with another attempt at relevance and breaking new ground with Hell, etc.’s release of The Pale Emperor. Along these past two decades, Warner has borrowed music and imagery from a great many other artists (not the least of whom is the obvious ancestor of Alice Cooper, though the man behind that name is actually a Born Again Christian). Somewhere along the way David Bowie became a favorite target of Warner’s. If the borrowed style doesn’t inspire memories of “The Thin White Duke”, then certainly the new album’s title, The Pale Emperor, will. While Manson surely does attempt a great many Bowie-esque vocal notes, The Pale Emperor is neither a return to Manson’s wild metal heyday nor does it borrow significantly from Bowie, aside from Warner’s vocal attempts. Instead, the Marilyn Manson we hear on The Pale Emperor presents himself in the form of a slow and driving murky metal that brings in elements of dark blues rock and even alternative country. Collaborating with Sons of Anarchy creator Kurt Sutter and outlaw country guitarist Shooter Jennings (son of Country pioneer Waylon Jennings), Manson attempts to tread new ground and burn a new trail through his attempt to infuse a “redneck” sound to his voice. While this seems to be a promise for a brave new era in the once mightily popular band’s career, the entire album contains no truly memorable lyrics. When Warner finds a lyric he likes, he simply repeats it scores of times to fill out an otherwise 30 second song to over four minutes. There are some occasionally interesting musical layers to the songs, but there are no truly memorable individual songs, unless the constant repetition causes a song to get stuck in your head. This catchiness is possible, much as in the case of the 1998 single “The Dope Show”, but it's hardly welcome. In many ways this is merely the same old Marilyn Manson trying to recapture the glory days and attain the chart success he enjoyed when he performed other people’s radio hits. This, as the album proves, is at the expense of any true experimentation or invention. The opening track “Killing Strangers” proves to be a tiresome, repetitive, and minimalist exercise that could be mistaken for virtually no other artist besides Marilyn Manson. In an attempt to remind audiences just who he was and why he was controversial, “Killing Strangers” repeats the words “We got guns” somewhere around one hundred times, often in a row. Manson alternates between moaning the lyrics in a bored fashion and screaming them until his voice cracks, but no variation can truly mask the fact that these are simply the same rather transparent lyrics repeated over and over throughout an otherwise unremarkable song. The second track, the more commercial single “Deep Six”, is a more musically diverse song and represents a higher point on the album. Written with new guitarist Tyler Bates, who produced the album along with Warner himself, the track sports catchy hooks and bridges, along with an infectious chorus. While the song features a polished production designed to make for a commercial radio hit, Warner’s vocals could have used a few more takes, as his screams feel much weaker than his driving, almost speaking verse voice. While some very dark metal growls and mysterious lyrics elevate the song and help make it much more listenable, it’s hard to miss the fact that the lyrics are once again incredibly repetitive, with just a few phrases repeated over and over ad nauseum. Also written with Bates, “Third Day of a Seven Day Binge” contains interesting chord progressions and guitar fills. However, there is nothing else truly memorable about the song. Instead of simply repeating the same lyrics over and over again here -- which he does -- Warner also attempts to echo “Killing Strangers” by repeating “I’ve got bullets” instead of simply “We got guns”. Good, Brian, we’d hate for you to be incomplete. When the song’s break comes, Warner simply screams the lyrics he has been repeating over his own backing vocals of “MMM-MMM-MMM”. This is a shame, as the music showed true potential for a very good song. "The Mephistopheles of Los Angeles" fits in well with the rest of the album in that, while it is somewhat more upbeat and faster than the previous songs on the record, it is no less repetitive, remaining a somewhat stripped-down and simple song. However, Bates seems to recognize the song’s limitations and pushes for stronger layers and musical fills. This song is one of the more powerful ones on the album, but much like every other track on the album, Warner seems to have found a few lyrics that he likes and can’t stop singing them over and over instead of writing new ones. It’s clear that he’s trying hard to drive home the point that he once was and wants to be "The Mephistopheles of Los Angeles". He also might consider investing in a thesaurus at some point in his career. "Warship My Wreck" begins with creepy ambient sounds before stretching into a dark and murky songscape, with lyrics like “Cut the hands off / Then kamikaze into your soul” (said twice in a row, of course). The experimentation into multi-layered textures is admirable, but the lyrics are weak and Warner’s voice is practically monotonous throughout the song’s runtime. “Slave Only Dreams to be King" is a heavy rock song with cacophonous drums and grinding guitars designed to give your stereo headphones and home surround sound a hell of a workout. Warner continues to be repetitive in the chorus and once rhymes “Hades” with “Ladies” for a lackluster lyrical experience. That said, this sixth song is much more powerful than the rest; it beckons the listener to repeated listens. The Pale Emperor’s seventh cut, "The Devil Beneath My Feet", doesn’t merely repeat the same lines over and over again: it actually repeats itself during individual sentences. This riff-heavy song gives way to "Birds of Hell Awaiting", a song that feels a lot like something the singer wrote while recording Depeche Mode’s “Personal Jesus”. The driving metallic Honky-tonk guitars give way to some trippy Ennio Morricone-esque spaghetti western-styled desert rock, all with Manson’s pained and tired wails stretched over the bleak structure of the music. During “Birds of Hell Awaiting”, I was curious as to how these songs might have sounded with a more capable vocalist behind the microphone. This became more true with the second-to-last song, the five-minute "Cupid Carries a Gun", with music written by Tyler Bates. "Cupid Carries a Gun" doesn’t merely seem to be intended to sound like “Personal Jesus” but is its own take on an electrified rock band embracing country motifs to formulate a unique and interesting song. While Warner’s low and gravelly voice does assist the song in achieving its eerie and strange creepiness, the lack of variation thereof doesn’t serve the song well enough to make it transcend to any other level. The slow, plodding blues/metal of "Odds of Even" finishes out The Pale Emperor. While this song might have put a proper punctuation on this album by giving us something unique and interesting, it feels interchangeable with just about every other track on this album. Occasionally the music feels like it could be a perfect accompaniment to a quality horror film. This is unsurprising, because Bates has been remarkably successful as a composer for such film scores as Guardians of the Galaxy, the Halloween remake, Watchmen and many other films. However, Warner’s limitations and concept for The Pale Emperor seem to be holding back this song and the album on the whole. With its bluesy chainsaw guitar solo by Bates, there is a great deal of promise for some kind of “epic” track on "Odds of Even", but no such payoff comes. The Deluxe Edition of The Pale Emperor contains three more tracks, including “Day 3”, a Western song that features Warner’s best vocals of the collection as he wails (on pitch) with the dark country guitars. However, much like the following two tracks, “Day 3” is nothing more than a different version of another song on the album proper, in this case “Odds of Even”. While “Odds of Even” may be a musically superior song in its production and layering, “Day 3” features a much better vocal performance from the otherwise lackluster singer, along with some rich and full acoustic guitar parts. While the rest of the album does play with alternative country as a genre, “Day 3” can scarcely be described as anything else. And here is why The Pale Emperor could have and perhaps should have been a much better and more diverse album. While it seemed to be Warner’s mission statement to create something of a very different, yet still hard and heavy Marilyn Manson album, these bonus tracks offer a much more daring and unique take on the album versions of the songs. "Fated, Fateful, Fatal" is an acoustic-based version of "The Mephistopheles of Los Angeles" that sounds like it could be best performed on the dusty porch of a saloon, with Warner tapping his boot heels in accompaniment. The acoustic version feels less simplistic and less stripped down than the electric version, probably due to Bates’ skills with the six string and production board. Even Warner’s incessant repetition feels excusable in this acoustic song; the lyrics feel improvised and somehow much more fitting than they did in any of the prior tracks. From this, it's easy to feel as if the outtakes were included on the album and the better versions were relegated to bonus tracks. Had Warner the courage to actually fulfill his promise of something bold and original, this new album might have been epic, as the three bonus tracks indicate. The third and final of these is “Fall of the House of Death”, an alternate version of "Third Day of a Seven Day Binge". With hand-clapping replacing percussion and Bates’ capable acoustic guitar proving to be an excellent wall of music, the electrified layers of this song sound significantly better. Even Warner’s voice shows the diversity that the album tracks sorely lack. “Safe” may not be a word often used with the music of Marilyn Manson, but it certainly applies here. The album itself is overall lackluster, with only a few jewels in an otherwise pronounced rough, even though Warner seems to be trying hard to experiment. With the final three bonus tracks we see the range and wealth of music that The Pale Emperor almost was. Warner has indicated that he is more confident in this “redneck” album than any he has released since Holy Wood. However, that confidence doesn’t show through in the lyrics, the music, or the risks that he comes close to taking and then avoids. Will this still be enough to provide a career boost that will stop the critical and commercial downward spiral the band has faced for decades? Possibly. But even if this were to happen, The Pale Emperor will never be the album it could have been, considering the talented backing of guitarist/producer Tyler Bates and returning original bassist Jeordie White.